Japan released the Prelim Machine Tool Orders y/y and the US will publish Federal Budget Balance and 10-y Bond Auction. The support rests at 106.170 with resistance at 107.190 which the weekly pivot point at 106.390 is located in between the lines. 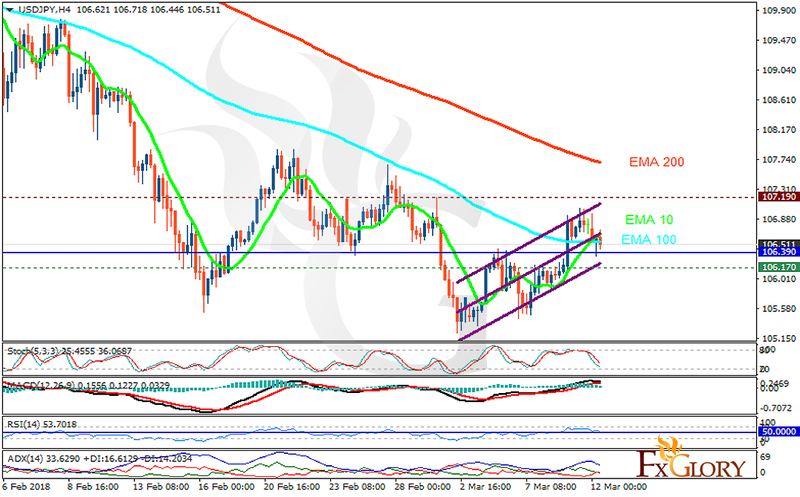 The EMA of 10 is moving with bullish bias in the ascendant channel and it is below the EMA of 200 and above the EMA of 100. The RSI is falling towards the 50 level, the Stochastic is showing downward momentum and the MACD line is above the signal line in the positive territory. The ADX is not showing any clear signals. Long positions are recommended towards 107.5.